I'm going to admit something - nearly every time I type "Coach" I have to pause and make sure I didn't type "Couch," which may be the same problem the search committee is having (there has to be some explanation). So, more rumors today regarding who will be named as PSU's new coach (not as much of an issue when all lower case for some reason). The candidate du jour? Bob Stoops (no, really) - and not just Bob, but his brother, Mike, who happens to be available this winter, as well. Sort of a gift with purchase kinda offer. Hey, while they're at it, brother Ron, Jr. is an assistant at Youngstown State (go Penguins!!!) and Mark is DC at fsu - why not bring them all in? We LOVE nepotism at PSU. Stoops is a former Hawkeye, where he played DB. His big coaching break came in the late 90s while serving as DC under Steve Spurrier (Yay! Tailgate Maven's BFF!) at Florida. 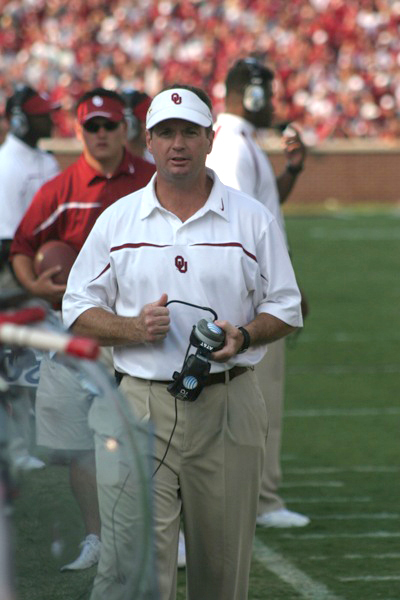 Stoops got the Oklahoma head coaching job in 1999 - where he has enjoyed enviable success. He is married and has 3 children. On the cuteness scale - He's not bad - but he seems to lack a twinkle in the eye (although they are a beautiful blue). I don't see him at Penn State - but, as we've been asking a lot lately, who knows what's right for PSU now? His current salary seems prohibitive - if PSU is going to match or increase that amount - I think we can do much cuter. "Like" the All Sports Museum; Vote for Greatness.